At the end of January 2019, Intersil-Renesas, a Dimac red’s premier supplier of advanced semiconductor solutions, introduced two plastic packaged, radiation-tolerant digital isolators that provide the highest isolation protection (2,500VRMS) from high voltage spikes in power supply stages and serial communications interfaces used in low Earth orbit (LEO) Small Satellites (SmallSats). Private “New Space” companies plan to launch thousands of SmallSats forming large constellations that operate in multiple LEO planes. 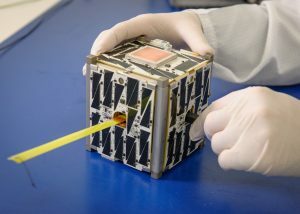 SmallSat mega-constellations provide ubiquitous broadband Internet of Things (IoT) communications anywhere across the globe, and Earth observation high-resolution imaging for sea, air, and land asset tracking. Intersil-Renesas’ digital isolators aid in the design of discrete isolated power supply designs as well as isolated serial communications interfaces. These isolators represent the highest data rate isolators available for radiation tolerant applications. Their isolation barrier is made using Giant Magneto Resistive (GMR) technology which provides superior isolation and radiation tolerance with lower dynamic current consumption; unlike transformer based isolator technology, there are no EMI concerns; and, GMR is superior to optocoupler based isolators, as the optics in the optocouplers are susceptible to “greying” or clouding over time due to radiation. The two most significant advantages are the much larger output signal GMR provides, and the high economics of scale this technology enables. Because GMR technology is compatible with integrated circuit technology, it allows for the design of monolithic GMR devices to be included as part of the chip package. This results in smaller, faster, and more precise devices, such as digital and analog isolators and sensors. 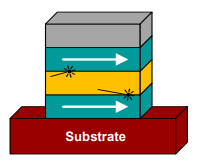 The electric resistivity of GMR materials depends on the relative magnetic alignment of the pinned and free ferromagnetic layers, which are separated by a non-magnetic, conducting spacer. Electrons scatter more frequently when their quantum spin differs from the magnetic orientation of the layer through which they are traveling. Thus, GMR is a type of spintronics, harnessing the spin of electrons rather than their charge. 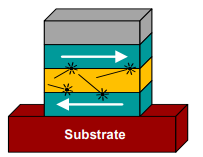 If the magnetic moments of the ferromagnetic layers are in opposing directions (Figure 1), electron scattering is maximized and resistance is at its highest. If the magnetic moments of the two layers are aligned, (Figure 2), electron scattering is minimized and resistance is at its lowest. Digital GMR isolators operate in fields where the pinned layer remains fixed, so the resistance of the spin valve is a bistable high or low valve. The ISL71610M and ISL71710M bring this isolation function to the customers in the space market, providing up to 600VRMS continuos working voltage at 85 °C. The electrical specifications have been characterized over the temperature range of -55 °C to +125 °C. Renesas’ Giant Magneto Resistive (GMR) digital isolators are ideal replacements for optocouplers that are susceptible to cloudy optics from total ionizing dose (TID) radiation. Both GMR isolators also out-perform transformer-based digital isolators that experience electromagnetic interference (EMI) due to radiated emissions from edge and dipole radiation. The Renesas GMR digital isolators are characterization tested at a total ionizing doze (TID) of up to 30krads(Si), and for single event effects (SEE) at a linear energy transfer (LET) of 43MeV•cm2/mg. In serial communications subsystems that need the transmitter and receiver electrically isolated from each other, the ISL71610M operates up to 100 Mbps, and the ISL71710M up to 150 Mbps. Both offer the New Space industry’s highest data rates–6x higher than competitive solutions–which make them ideal for serial communications links, such as RS-422, RS-485, and Controller Area Network (CAN). The radiation-tolerant plastic flow used on these products provides the optimal in cost vs. radiation performance, when compared with Class V isolators. To know more about this products contact Dimac red.